We’re finally getting cool Fall weather! (In fact – yesterday we had just a dash of snow…) So – Fall Vegetables are coming in. 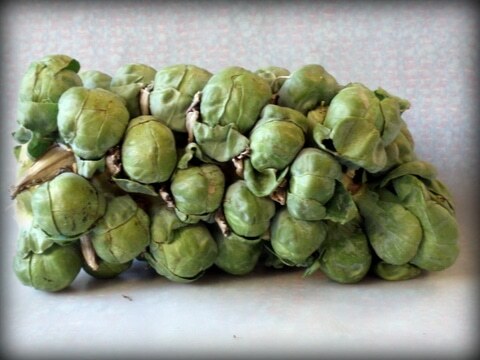 Most of us usually get Brussels Sprouts in a little cardboard tub, covered with cellophane held on by a rubber band. Right? 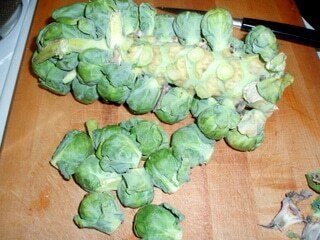 But they actually grow on a stalk, popping out in mini cabbage heads in the most fanciful looking way. This is actually just half a stalk. We have a Small Share from our CSA – plenty for the two of us – and they cut the stalks in half. (Families with Full Shares got a whole stalk.) You can see why processors and supermarkets don’t want to deal with the stalk (which is not edible) – bu they are fun. Brussels Sprouts are cruciferous vegetables. That means they are part of a whole family, including cabbage (well, yeah) broccoli, cauliflower, turnips, kohlrabi, and more. 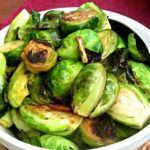 Many of these grow beautifully in cool weather, and keep well in a root cellar (or, these days, refrigeration) so they are classic cold weather vegetables – particularly grown in colder climates. The cooking of Northern Europe just would not be the same without them. They’re also incredibly nutritious – plenty of vitamin C (which got many generations in Northern Europe through long winters with no other fresh food…) and other nutrients. Unfortunately, they are also vegetables that many people dislike. There seem to be two major reasons for this. The first is an annoying compound that tastes bitter to some people, but is completely tasteless to others. 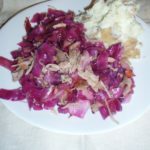 Those who do taste it have varying sensitivity, so a food with it may be bitter beyond edibility to one person, just slightly annoying to another, and not bitter at all to – well – me. 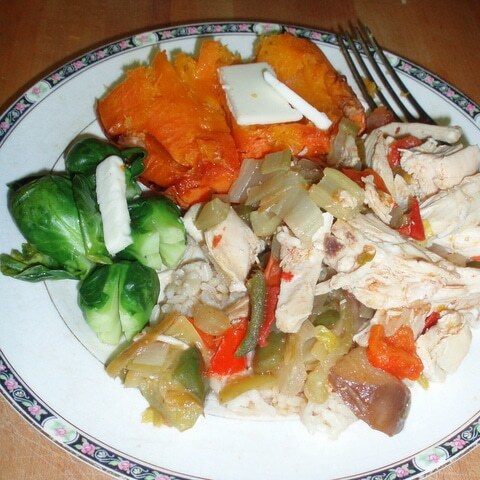 At the same time, these are firm vegetables, and you need to cook them enough to tenderize them. 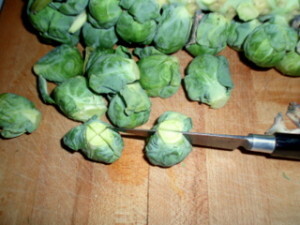 With Brussels sprouts, each cute little sprout has leaves which cook quickly and a core which doesn’t, which complicates that. preference. I like them a deep emerald green, which is too lightly cooked for many people – they’re still a bit crunchy. A light olive is still all right – try one, and see how you like it. And remember, it’s going to continue cooking even off the heat, if you leave the lid on – sometimes it’s best to turn the light off early, and let them finish steaming while you serve. This is a very basic approach. It simply stars the vegetable itself (with perhaps just a little butter) and is always the way I cook and celebrate the first sprouts of the year. I can taste the bitter compound somewhat, but I also don't mind. We've found that roasting the sprouts yields something both of us like. As many of us don't mind the slightly bitter taste of coffee... yes. I haven't tried roasting, yet, but plan to, in the next month or two. (I don't use the oven very much - ours is very inefficient and heats up the whole apartment.) I have pan roasted them for the first time, and liked it. 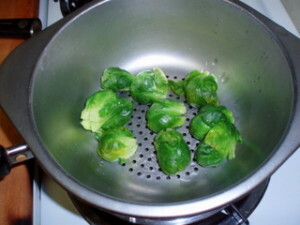 Those sprouts had yellowed a little, and were sad looking... and the pan roasting (and slight charring) definitely helped that. When I know more about it, I'll post!